In a mash-up that combines elements of the now-trending escape rooms with a timed relay race and a scavenger hunt, a young Spokanite is organizing an event called Treasure Hunt Spokane early next month. Garrett Schoen, 23, is a self-described "wantreprenuer" who came up with the idea after seeing a post on Reddit about birthday party treasure hunts for kids. That concept was getting a lot of feedback from users, so he thought, "Why not put together something similar but for adults?" Treasure Hunt Spokane's first "hunt" is set for Sunday, May 8, and tasks teams of two or more to solve riddle-style clues that take them from secret location to location in and around downtown Spokane. The fastest team to reach the final location on the map for the hunt (after stopping at all previous stops) wins $250 in cash. To alleviate chaos and bottlenecking at each of the scavenger hunt stops, Schoen decided to offer two start times (8 and 9 am). To determine the winner, he'll rank each participating team's final times, and whichever has the fastest gets the grand prize. Local businesses around Spokane are hosting scavenger hunt stops, where teams will check in to get another riddle directing them to the next stop. Stops on the map are all located within 2.5 miles of each other, but spread out enough that Schoen says you'd waste precious time (and gas) by driving around trying to find them without solving the riddles he's written. 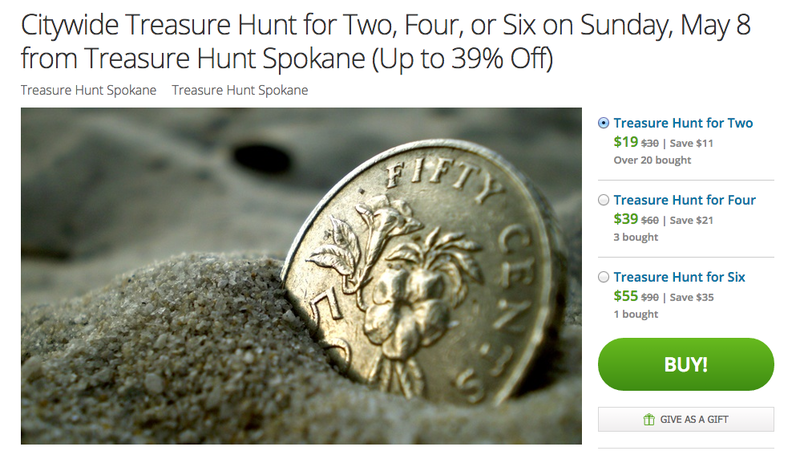 So far, more than 100 people have signed up to participate in Treasure Hunt Spokane. Tickets are only sold through Groupon, and teams can register as late as the night before the race. Entry is $19 for two people, $39 for a team of four and $55 for a team of six. The prize pot of $250 comes from those ticket sales after Groupon takes its cut. Schoen says he plans to organize future treasure hunts in Spokane and hopes to expand to other Northwest cities. "My plan is to go city to city, and have it be a thing where each weekend I go to a new city to run the event. I don't want to have too many in one city — I want it to be something people look forward to," he says.